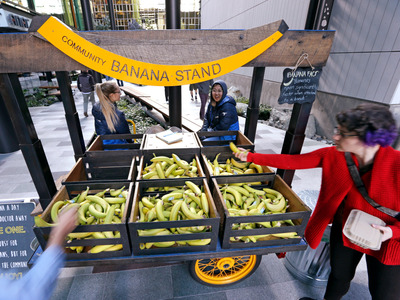 Getty/Elaine ThompsonThe Banana Stand at Amazon’s headquarters in Seattle offers bananas to everyone for free. Amazon is at the top of LinkedIn’s Top Companies list for 2018. Amazon was No. 2 last year, behind Alphabet, Google’s parent company. LinkedIn considered “interest in the company, engagement with the company’s employees, job demand and employee retention” to come up with these results. Amazon is now America’s most desirable place to work. The company topped LinkedIn’s Top Companies list for 2018, beating out Alphabet, Google’s parent company, which came in first last year. To compile the list, LinkedIn takes into account things like “interest in the company, engagement with the company’s employees, job demand and employee retention.” That means the study was not based on reputation as gathered by a survey, but instead on how people actually use and interact with companies on LinkedIn. Amazon was chosen for its “endless expansion,” both in terms of the business sectors it’s moving into and in terms of its customer and revenue growth. LinkedIn notes that it is an exciting, fast-moving, and ambitious company where it is always “Day 1” – Amazon speak for staying nimble, fast, and results-oriented. “Day 2 is stasis. Followed by irrelevance. Followed by excruciating, painful decline. Followed by death. And that is why it is always Day 1,” Amazon CEO Jeff Bezos once said in a letter to shareholders. Employment is diverse at Amazon. Its Seattle headquarters employs about 40,000 people, but the company also has corporate offices in many major cities across the country. Warehouse employees round out the rest of the workforce, making Amazon the US’ second-largest employer at 566,000 strong. Amazon is growing so much and so quickly that it’s now looking for a second headquarters. It’s narrowed the possibilities down to 20 cities for what has be ome known as its HQ2 project. Amazon has promised a $US5 billion investment and 50,000 jobs for wherever HQ2 is built. Employment at Amazon isn’t all rainbows and unicorns, however. The company’s Day 1 philosophy means that things can change quickly. The company eliminated some positions earlier this year while offering employment elsewhere in the company. It also means that working at Amazon can be demanding.